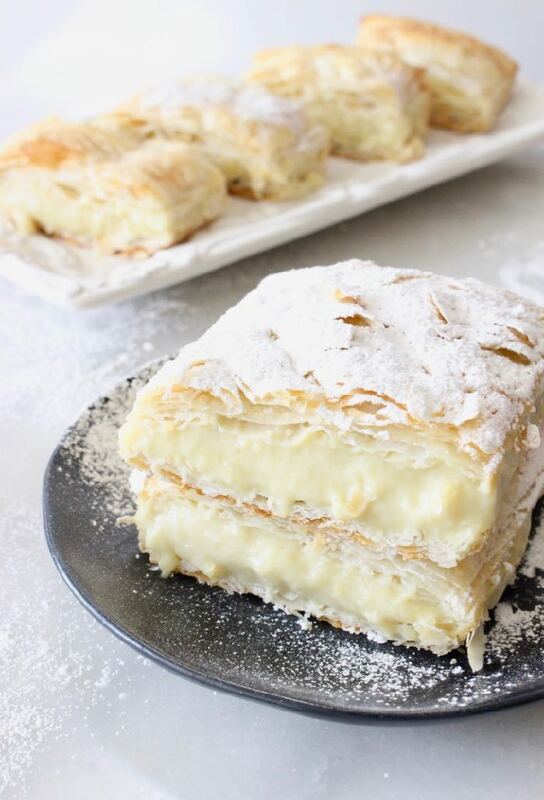 Easy vegan custard puff pastry Napoleon made with rich coconut and cashew milk, vanilla extract and thickened up with tapioca. Dairy-free and naturally sweetened with maple syrup. I meant to post this dessert last Christmas but it clearly didn’t make it to the blog on time, so now you have it ready for Valentine’s and Easter with plenty of time to do a practice run ahead. Let’s do this! 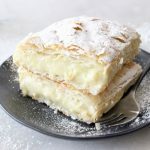 ” Mille Feuille ” also known as a “Napoleon” a classic Neopolitan pastry dessert of ancient origin filled with a rich and thick vanilla custard or “ crème pâtissière “ – pretty much a dessert sandwich! Why is Napoleon called Napoleon ? 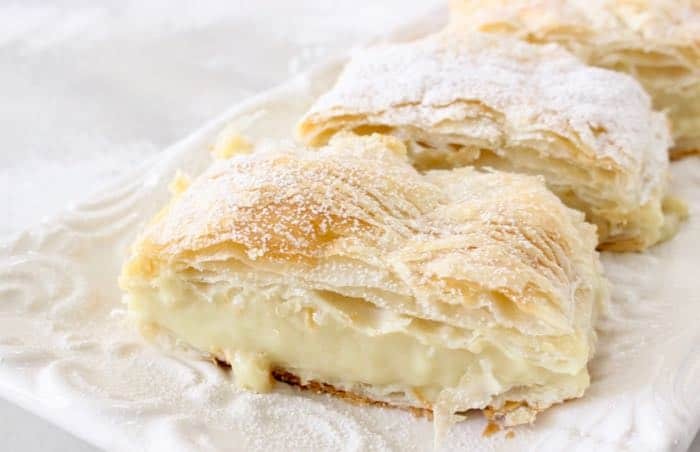 The dessert’s original name was a “ napolitain or millefoglie “ meaning a “ thousand leaves “ referring to the many flaky layers surrounding the custard. So a sweet treat in the style of Naples not France, yup that’s the Napoli from Italy! 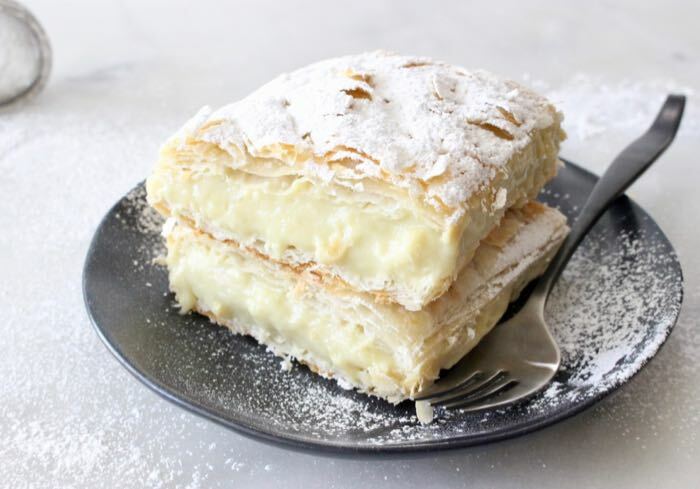 It is thanks to the French pastry chef Careme who made the dessert popular that France is taking credit for the Napoleons. Wowza for culinary history! It is as simple as whisking together some plant milk with tapioca and simmering together until thick. Sweeten with maple syrup and infuse with some good vanilla extract for the best, most decadent plant-based custard. 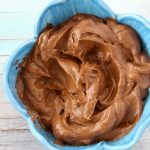 You can let it cool and enjoy it as a pudding topped with your favorite fruit or preserves, use it in a trifle, to fill a tart, a pie, a cake or to make some lovely Italian pastry desserts like yours truly. 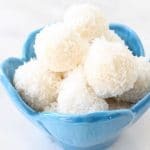 note: If you don’t have tapioca on hand you can replace it with arrowroot or cornflour/cornstarch. 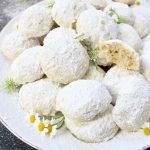 FAQ: Is Puff Pastry Vegan ? Believe it or not puff pastry is one of those items that are accidentally vegan, however make sure to still check the ingredient list on the back of the box you are purchasing. Can You Make Custard with Almond Milk ? Sure, you can replace all the plant-milk in the recipe with almond, just know the result won’t be as luscious as it is with the higher fat content from coconut and cashew milk. P.S. If you make this recipe please come back here to rate it, snap a photo and tag me with #VeggieSociety on Instagram. Defrost the puff pastry according to the instructions on the box, usually 30-40 minutes at room temperature. Preheat your oven to 400”F. Roll out the pastry sheet on a parchment lined cookie sheet, pierce with a fork and cut it in half lengthwise. Bake in the preheated oven for 15-20 minutes until golden brown. Remove from the oven and allow it to cool. In a medium sauce pan over medium flame whisk together the cashew and coconut milk, maple syrup and tapioca. Bring to a simmer and continue whisking for a good 5 to 10 minutes on medium-low flame until the custard has thickened. Whisk in the vanilla extract or seeds and allow to cool off. (If you wish to give your custard a more yellowish tone make sure to whisk in the turmeric as well. It won’t affect the flavor just the color). Carefully separate the top and bottom part of the puff pastry, it should easily come apart. Place the bottom parts in a small baking dish lined with parchment paper. 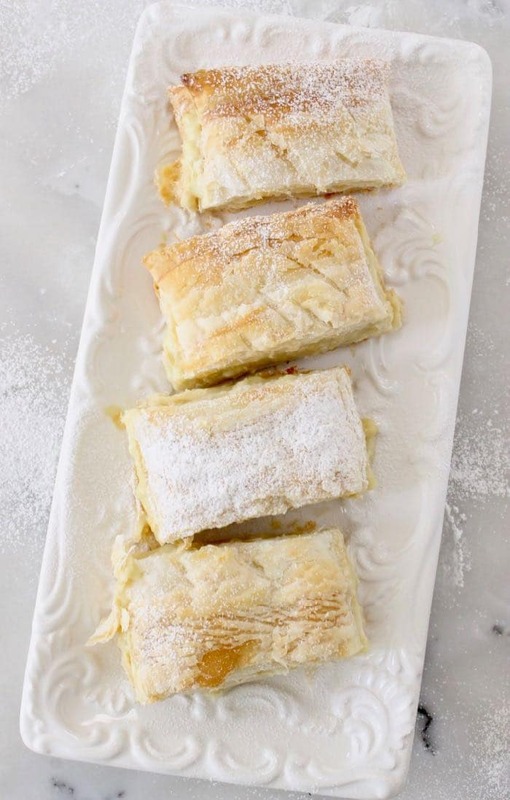 Spread the vanilla custard on top and cover with the top layer of puff pastry. Refrigerate for 3-4 hours until set. Use a serrated knife and cut into 10 rectangles or 8 squares to your liking. Dust with powder sugar and serve! I made this for the first time today and it is amazing!! My entire family loves it! This looks elegant! Any ideas on how this can be made Gluten Free? Many thanks! Hi Gayle, i would search for a gluten-free puff pastry out there or trying making your own. Let me know if you experiment with that idea! This is truly amazing and I can’t express my enthusiasm at the fact that I made Custard Puff Pastry that is vegan and no one believed me it was vegan. My favorite dessert of all times, thank you for making it so easy and effortless for us. Hi! Can you tell me which brand of coconut milk and which brand of tapicoa did you use? I’m so excited to make this for my husband!! Absolutely amazing!! My local grocery store didn’t have cashew milk so I used more canned coconut milk instead. I also used both sheets of pastry dough that came in the package and made two sections of cake with 3 layers of pastry and two layers of custard/cream each. 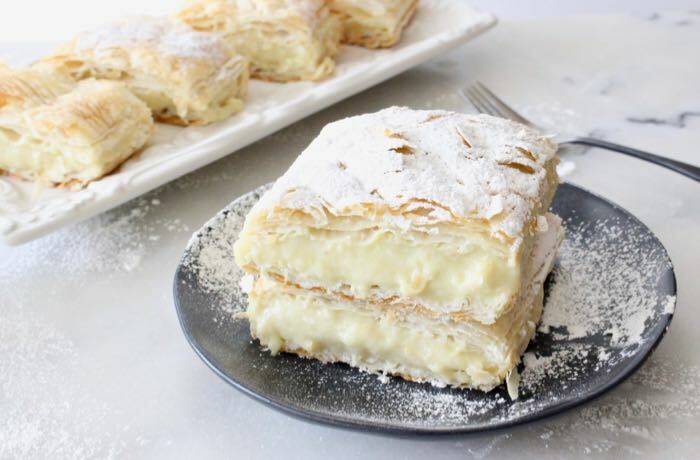 My Russian husband said it tastes just like Napoleon cake he used to eat back home!! Yay! I will definitely be making this again!